short girl, long island. : Dancing Elves, Spray Tan Overload + Plastic Ponies. Dancing Elves, Spray Tan Overload + Plastic Ponies. I am a rare breed, to say the least. If you were unaware of this, by the end of this post you will understand the severe level of strange that I exude. Here are a few things that I've conjured up in my dome, +/or saw on the 'net + found intriguing. Erich makes this insanely creepy face that makes me laugh hysterically, even when I'm in a horrible mood. I decided to put these pictures to good use, with Elf Yourself. I also added Penny + Puar, for good measure. I didn't send out Christmas cards this year, so consider this your card for the season. We went green + creepy this year. I can't decide which one I like more, the hip hop or soul version. I'm telling you, this is the best way to waste time + procrastinate from completing schoolwork or anything else that you should be working on. Tonight, as I was watching Friends [The One With Ross's Tan] while working on blog things, I had an epiphany of sorts. 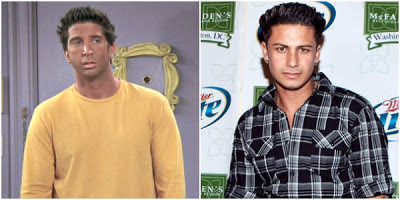 Ross was totally rockin' the laughable Pauly D. Jersey Shore hair + skin spectacular six years before the Italian Stallion was gracing the world with his, uhhh, talents. Behold! The last few days, Erich has been seriously sick. Luckily, he has been on the road to recovery, but has been pretty weak + tired. The other night, when I went to the pharmacy to pick up his medicine, I wanted to snag him a few things to cheer him up. I grabbed a car magazine, a Yoda Christmas ornament [that is apparently broken + needs to be returned now], a Christmas cup + a My Little Pony. Now, why would I buy my twenty-something boyfriend a small plastic pony? Well, awhile back, we discovered that dudes who dig the Ponies call themselves Bronies. I think its awesome - as a child, I had a plethora of MLP's, plus watched the show religiously. Erich is not a brony, but I knew getting him this little plastic beast would make him laugh. When I got home, I had him take each item out of the bag, one by one. When he opened eyes and saw what I got him, he laughed for the first time in days. I tossed it in my bag this morning, because Penelope was trying to attack it [she thought it was a new toy for her]. When I went out to dinner tonight with a friend, I pulled it out of my bag + put it on the table, as she was talking. 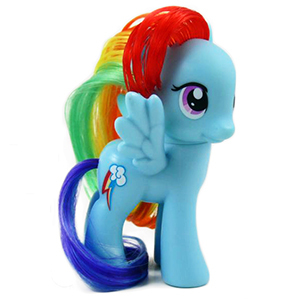 I made another person laugh, thanks to this little plastic pony. I think its safe to say this purchase was a success!